The dastardly demons of demagoguery are at it again. You know who I mean – the Republicans and Tea Partiers who swaggered through Washington in the past two weeks, brandishing cutlasses and slashing funds to needy women and children. Republicans would gain more credibility if they could find even a few dollars to cut in a military budget that exceeds $1T – that’s trillion, as in 12 zeroes. But, they have kick started the debate. Below is a chart of per person federal, state and local spending in real, inflation-adjusted dollars. This does not include what are called transfer payments, like social security and unemployment checks the government sends out. More military spending, more social welfare programs, more health care programs, more regulatory agencies and it all adds up to a 60% per person increase over the past 60 years. 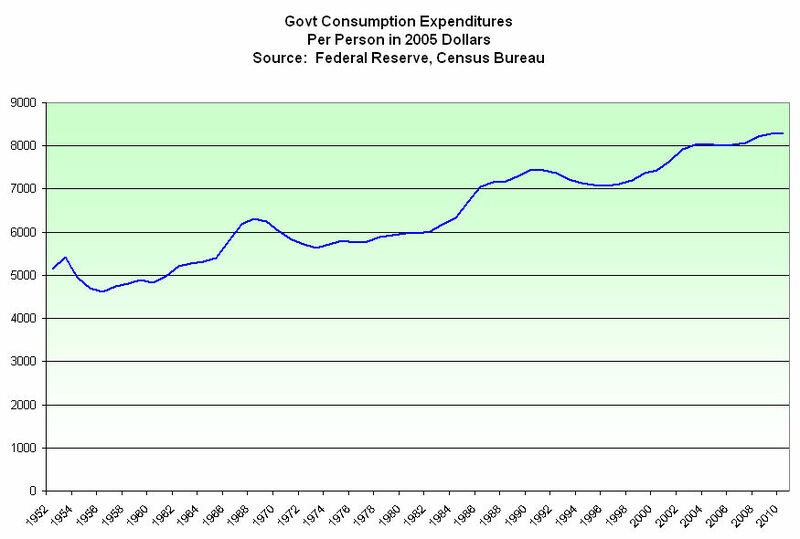 When do we start having the conversation about reducing government spending? When the increase is 100%? That has been a question that few politicians wanted to tackle. In 2010, President Obama appointed a debt and deficit commission which made recommendations in December 2010, after the elections. Some Democrats in tightly contested 2010 election races did not want to have any budget debates before the election, leaving then speaker Nancy Pelosi without a convincing majority in the House. The Republicans in the Senate had one word in response to most Democratic House bills – “No”. Unable to break Republican filibusters in the Senate, any budget resolution passed by the House would probably have gone into the Senate trash bin. In February, the Obama administration ducked the deficit commission recommendations when it presented the FY 2012 (Starts Sept 2011) budget. In this game of political chicken, someone finally went first! On April 5th, Paul Ryan, the Republican House Budget Committee chairman, revealed his committee’s 2012 Budget proposal. This past week, President Obama presented his long term budget “plan” as a rebuttal to Ryan’s plan. The NY times has a short comparison of the two plans. An innocent bystander might ask why the President could not present his administration’s plan when he presented the 2012 budget proposal two months ago. Military spending has to be the first subject of any reasonable discussion. Including pension, health care and training programs for ex-military, the $1T in current military spending is $3333 per person, or almost a third of the $9400 (in current dollars) per person government cost. Structural changes to Medicaid and Medicare have to be the second topic of discussion. In January 2010, the Congressional Budget Office estimated 2010 Medicare and Medicaid costs at $800B and projected yearly increases of 7%, more than double the average 3% inflation rate of the past thirty years. Some Democratic politicians accuse the Republicans of throwing women, children and the poor under the train and advocate higher taxes on the rich. But there simply aren’t enough rich people. In July 2010, the IRS released an analysis of 2008 tax returns. If the Federal government were to confiscate ALL the adjusted gross income of those making $200K or more, that would total about $2.46 trillion in 2008 dollars, or about $2.6 trillion in 2011 dollars. That amount is about 2/3 of estimated Federal spending in 2011. The 2011 budget has a projected deficit of $1.65 trillion (Wikipedia article) How much would we have to tax every rich person to make up this year’s deficit? In 2008, the IRS reported that there were almost 4.4 million taxpayers making more than $200K. We would need to charge $375,000 to every one of those taxpayers to make up this year’s deficit. Obviously, we couldn’t get people making $200K to pay $375K in taxes. So let’s pass a law to soak the 319,000 millionaires by taking away all of their deductions and take 90% of their income. That will give the Federal government $900B in additional revenue but we are still short $750B. Let’s take away all the deductions for those 574,000 people making more than $500K and tax them at 90%. That will raise another $351B but we are still short about $400B. Finally, we take away all the deductions for people making more than $250K and tax them at 50% and we have balanced the budget for this year! Taxing the rich won’t solve our budget problems. Reducing spending alone will not solve our budget problems. We need a combination of higher taxes on everyone and reduced spending. Unless we can come to this two part solution of higher taxes and lower expenses, we will continue to run deficits and ever higher long term debt. In the next decade, bondholders will demand ever higher interest rates to buy this country’s debt. Increasing interest payments will only make this country’s spending problems worse. The time to act is now.